And the dead will outnumber the living!" These lines are one of the earliest deliveries for the most popular and most exposed genre of horror creatures around ,the Zombie. The idea of the walking dead is prevalent in today;s pop culture, yet its true origins can be traced back to either the epic poem or as a mystical theme in vodou, where the dead can be reanimated by a mystic (West Africa) or a human can be turned into a zombie servant by a special powder (Haiti). 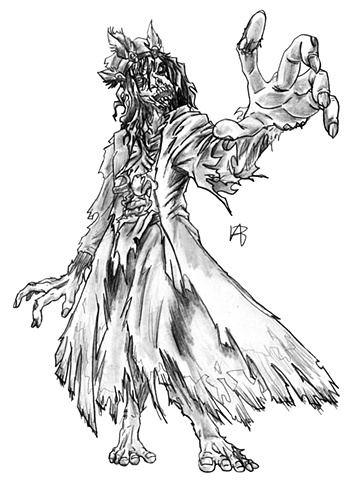 Nowadays, the zombie is a staple used to serve as an allegory for the fears of the time, whether conformity ( Night of the Living Dead), terrorism (28 Days Later), science gone wrong (Frankenstein, Resident Evil, and as a backdrop to the human condition (The Walking Dead). My zombie uses the Mesopotamian version with a crude rendition of their clothing in tatters and exposed torso in its awkward gait and reaching out for its prey.